Breakthrough Advertising: How to Write Ads That Shatter Traditions and Sales Records is an absolute classic in the field of marketing. 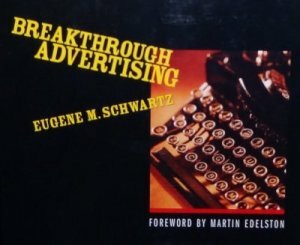 Its publisher claims that the ideas in Breakthrough Advertising have generated millions of dollars in revenue for its readers, and this is one of the few books that I would believe that claim. But if you don’t have the $95 to splash out on a copy, I’ve summarized the book in this post. If you like this summary, please leave a comment! The approach in this stage is essentially to call your market together in the headline. You are writing an identification headline. You are selling nothing, promising nothing, satisfying nothing. Instead, you are echoing an emotion, an attitude, a dissatisfaction that picks people out from the crowd and binds them together in a single statement. Be simple, be direct. Name either the need or the claim in the headline – nothing more. Dramatize that claim in your copy – make it as powerful as possible. And then bring in your product, and prove that it works. A new stage of elaboration and enlargement. But this time, the elaboration is concentrated on the mechanism, rather than on the promise. Simply elaborate or enlarge upon the successful mechanism. Make it easier, quicker, surer; allow it to solve more of the problem; overcome old limitations; promise extra benefits. The purpose of body copy is to alter the prospect’s vision of reality, to create a new world – a world in which your product emerges as the fulfilment of the dominant desire that caused this person to respond to your headline. Desires. These are the wants, needs, cravings, thirsts, etc. that drive your prospect. Identifications. These are the roles your prospect wants to play in life, the traits he wants to build, etc. Your task is put them directly behind your product, and to make him feel part of a select group when he becomes a user of that product. Beliefs. These are the opinions, prejudices, fragments of knowledge, and conceptions of reality that your prospect lives by. Believing is a process – a process of fitting new facts into certain established patterns of thought and conviction. Beliefs form a filter through which your product information must pass or be rejected. You start with these beliefs as a base, and build up using your prospect’s logic to prove that your product satisfies his desires, to prove that your product works, that his kind of people rely on your product. This is the process of starting with the facts that your prospect is willing to accept, and leading him logically and comfortably through a gradual succession of more and more remote facts – each of which he has been prepared to accept. a. Ask a question to get the reader to self-select as a member of your audience. The purpose of redefinition is to redefine the drawbacks of a product, so the perceived drawbacks don’t kill a sale. Remedy this by simplifying the product. Remedy this by escalating the importance of the product: broaden the horizon of benefits of the product; redefine the role that the product plays in the prospect’s life; widen the area of reward that your product yields to the prospect – showing him that it enters into dozens of vital situations every day, paying off for him when he might least expect it. Yes. You pay $2,000…$3,000…$4,000 for your car. And a single 99 cent part robs you of the real power and enjoyment that a car should give you. First rule of mechanism: never turn the copy about mechanism into scientific discourse. You must load it with promise, load it with emotion. Concentration is the careful, logical, documented process of proving ineffectual other ways of satisfying your prospect’s desire. By pointing out the weaknesses in the competition, emphasizing their disservice to your prospect, and then proving to him that your product gives him what he wants without them. The first mood adaptation is understatement, e.g. simplicity, a lack of color or words, no superlatives, short sentences. All I ask from you is this. What you are going to do, in the very first hour that you receive this book, is this. And yet it’s only the beginning. THEN put this simple trick to work for you-that VERY SAME HOUR. Read the thrilling answer below. Just wait till you try this. And you will do it using nothing more than ordinary tap water, your own ten fingers, and the contents of your garden and your refrigerator.